In order to avoid misuse of sensitive personal information, the Unique Identification Authority of India (UIDAI) launched a service, by which users can "lock/unlock" their biometric data. You'll have to enter your mAadhaar password. Once authenticated, your biometrics will be locked, and you won't be able to do any transactions now. You can also use the toggle button in mAadhaar app to lock/unlock your biometrics. For this, click on the three dots icon on the top-right corner of the mAadhaar app. Then switch on/off the 'Enable Biometrics Lock' toggle button. UIDAI portal, click on 'Lock/Unlock Biometrics', under 'Aadhaar services' section. You'll be redirected to the biometrics locking section. 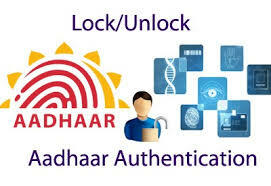 According to the UIDAI, the (lock/unlock) facility protects privacy and confidentiality of residents' biometrics data. The facility, by allowing the temporary locking and unlocking of one's biometric information, ensures that the Aadhaar holder can't use their biometrics for authentication, thus preventing potential misuse of information. GO TO https://uidai.gov.in/ and than go to lock/unlock aadhar card enter aadhar no than enter the Security Code.